Google has unveiled its second-generation flagship Android smartphones, the Pixel 2 and the Pixel 2 XL. 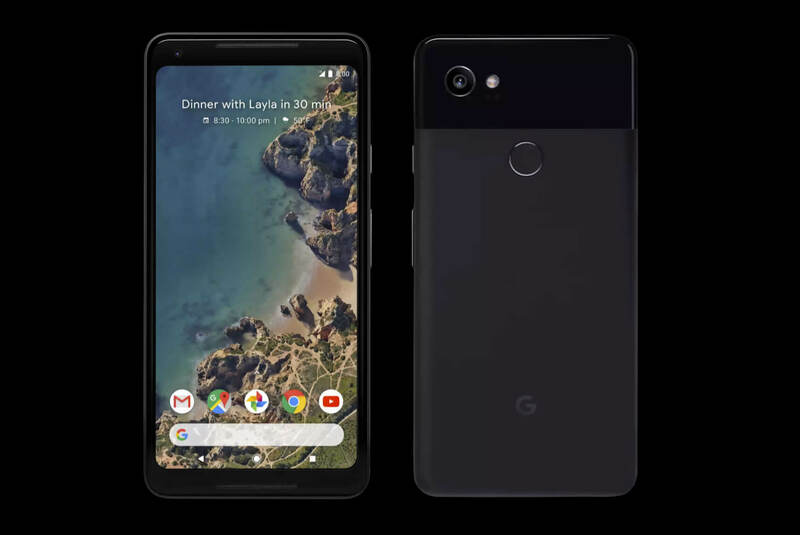 Specs and design cues we had reported from leaks in previous weeks were spot on, with high-end specs shared between the two phones in line with other competing Android handsets, including premium pricing that starts at $649 for the Pixel 2 and $849 for the larger and sleeker Pixel 2 XL. Google is also throwing in the $50 Google Home Mini as part of the package with every purchase of either Pixel 2 phone, which is certainly a plus. Shared specs include a Qualcomm Snapdragon 835 processor, 4GB of RAM, 64GB or 128GB storage, 12.2MP dual-pixel rear camera with OIS, 8MP front camera, "Active Edge" squeezable sides, IP67 water resistance, USB-C, and Bluetooth 5.0. There is no wireless charging option, though Google claims you can get fast charging at a rate of 7 hours of battery life on a 15-minute charge. The headphone jack is also absent, but you do get stereo speakers, USB-C headphones in the box, and a dongle to connect wired headphones using USB-C. Both Pixel 2s use OLED displays with the option to use it as an "always on" display similar to Samsung's Galaxy phones. The Pixel 2 has a 5-inch display (1920 x 1080) in a body that is very similar to last year's phone -- that is, with fat top and bottom bezels. The larger Pixel 2 XL is almost the same size as 2016's XL but sports a much larger 6-inch display (2880 x 1440) and a sleeker profile as can be seen on the top photo. Google Assistant is built in, which was a differentiator on last year's handsets. Google is touting the combination of hardware and machine learning once again, so there are a few other software features included in Pixel 2 such as Lens, Google’s new object recognition technology. There's also a portrait mode feature on the front and rear camera (using only one lens combined with machine learning). On the design front, the new Pixel phones follow a similar language as last year's models with an aluminum unibody, a portion of the back covered in glass, no discernible antenna lines (hence the glass), a fingerprint reader centered on the back of the phone, and a front glass slab. The displays while bigger than last year's, do not present radical lines or curves. The Pixel 2 cameras have been improved over the original models, which were touted as the best phone cameras you could find on a smartphone. We're finding contradicting statements about the camera hardware, some claiming the hardware is about the same but with software making up for the improvements which has already earned it a record 98 score in DxOMark. The Pixel 2 starts at $649 and the Pixel 2 XL will set you back $849, both unlocked by default with 64GB of storage. An additional $100 will bump you to 128GB. Note the Pixel 2s have no microSD slot expansion. The Pixel 2 and Pixel 2 XL are available for pre-order starting today in select countries with shipping slated for October 19 and November 15, respectively.